Lake Winnipesaukee is 42,000 acres of boating paradise. 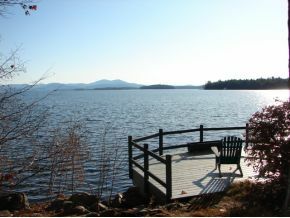 This home has stunning views looking South and West to the Belknap Mountains including views of Gunstock Ski Area. Listed by Coldwell Banker. 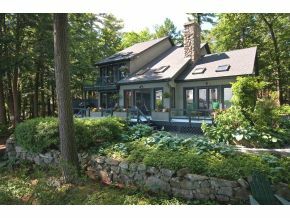 A beautiful home on a point of land with a total of 204' of very private Winnipesaukee waterfront, it is located in low tax Moultonborough. Custom interior includes black cherry woodwork, granite counter tops, sauna, outdoor hot tub, hardwood floors and a beautiful field-stone fireplace. Great natural landscaping and decks at the waters edge; end of the road privacy. The home offer 9 rooms, 4 bedrooms along with 4 bathrooms. The long open water views add to the spectacular sunsets. In addition to all the boating Winnipesaukee offer some of the best salmon fishing in New England.